Elk is a rich, dark chocolate, with correct conformation and a superb temperament - calm, gentle and eager to please, as well as being very intelligent. He was certainly a joy to own! 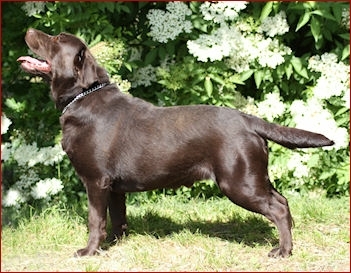 Elk consistently produced super puppies and has Crufts qualified progeny in the show ring. Elk has now retired to a wonderful home, where he’s enjoying being the centre of attention!